To follow up on my previous post, I would first like to say that I write from my heart......my human heart. I am not the most eloquent with words and may not speak with love and gentleness all the time. This blog is strictly my opinion, in which will hopefully give support to the many women who are having the same struggles that I am having.......I do realize there are going to be women who come across my posts and think I am attempting to gather flies with vinegar instead of honey.....that isn't the case. As my Pastor says, when we speak truth of scripture, people who are not in line with that scripture will want to shoot the messenger. It has also been brought to my attention that there are other ways to dress than what I mentioned. I agree, there are many other ways of dressing, ways of dressing according to the world. The question is, are you dressing in a way that honors God? The choices we have made for our family, about how we dress, is between God and us. I am not here to "push" it on anyone else, that is between God and them. We dress in a very "prairie" way because that is our taste. As each woman begins to turn her heart towards dressing modestly, she will begin her own journey. As a Christian we grow into our own faith, our faith may not look like the faith of our parents....meaning maybe your parents are missionaries and you are not being called as a missionary, but as a writer. God has called each of us for a different purpose with one goal. Likewise, our own sense of modesty will be different from one anothers, but should prayerfully be towards one goal.....to honor God. In saying all of that.....here are some pictures that illustrates our way of dressing. Since I am usually the one behind the camera, there aren't any pictures of me but my daughter and I dress in the same manner. The above skirt is one that can be worn with a pretty blouse, sweater.... we both have this style of skirt. 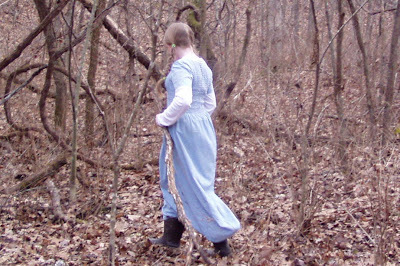 The above dress is worn for church and for town. The above dress is strictly worn as a chore dress around the farm.....it has gotten more snug than we care for and now is worn with a shirt over it. Since the skirt is a great skirt, it will soon be made into just a skirt or with a new bodice if I can find the time with planting season coming on fast. This is a picture I was able to catch a few years ago when our grand daughter was visiting. It shows how different our dress was then compared to now. Now, we would never show that much skin on our arms, not only for modest reasons, but also for reasons of sun exposure. If you have already been blessed by knowing who Stacy McDonald is....here is a bit of her writing on scriptural modesty. Below is a link to her whole text. Please see the whole text at "Let's Talk Modesty". I would like to thank you for all of your supportive comments, sometimes we feel so alone as we make this journey and it is SUCH a blessing to hear from others who rally around us, letting us know we are on the right path. What is SO frustrating is standing in the midst of other professed Christian women that give us so much grief due to our choice to dress modestly. There have been times, in church, where we are almost verbally attacked because we choose to dress differently and for some reason it offends some other women. I truly believe that most of the comments and questions are due to curiosity, but most are never said with love and gentleness. There is the occasional comical discussion where someone attempts to "liberate" my way of thinking. They will literally take it upon themselves to feel the need to free my "legalistic" ways. As if I truly believe that if I dress "holy" enough, that will gain me my salvation. It is interesting when after I patiently listen to all that they have to say and I respond softly with answers to why we dress the way that we dress, backing it up with scripture, reassuring them that it is something we do to honor God and not to work our way into His good graces, they listen whole-heartedly. One of the many things I have learned is when I step out, voicing my convictions and testimony, it gives others the strength to follow. Never underestimate your ability to speak truth into someone's life! Your voice may be used by God to say just the right thing to the one person who is waiting to hear it! As I read the post and looked at the pictures I noticed the black leggings under the skirts/dresses. My daughters did buy these for the winter time and loved having warmer legs. Today, we all have on our long denim skirts and t-shirts. Great posts! I just recently found this site,but it has already become something i check daily. Because we are Apostolic, my two girls (ages 8 and 12)and I dress modestly, skirts well below the knee, shirts well above collar bone, and shirts well beyond the elbow. I know the feeling of someone trying to talk me out of the way I dress. The funny thing is that when I dressed worldly, NO ONE CARED!! I dress this way for several reasons, because it is biblical, because it shows respect for my husband, and because I do not want to lead my brothers in Christ astray by "flaunting" myself. I want to keep the gift of my body a gift for my husband alone, and that is something I am teaching my girls. I also teach my 2 sons not to be led by a pretty figure, but to look for a woman who loves the Lord! Its refreshing to see that I do not fight alone, but that there are other mothers who care enough about my sons to teach there daughters the right way to dress! God bless you and your family! Thank you Donna, and yes, we could not make it through winter without some form of leggings. We usually use the soft insulated ones. If the dress material is a thinner quality, we have been known to were another light skirt under the dress just to add another layer of warmth. With spring coming, we have already had some warm days where we haven't worn the leggings and after wearing them the whole winter, it feels odd to not have them on! Hi Amanda and welcome! You are SO right, when I dressed worldly, no one did care. In essence, the devil didn't need to bother us because we were helping him out! I believe that most Christian women aren't trying to flaunt themselves, but there are not paying attention to scripture. Scripture says that we are not to cause our Christian brothers to stumble in any way so we HAVE to be proactive to make sure there is nothing about us that can cause them to stumble or we have sinned. As a mother with a daughter I'd like to say thank you for raising your sons to know the difference between a Godly girl and a worldly girl. I heard a mother the other day talk about walking through a mall with her son. A girl walked past them, dressed very provocatively and gave him a "come and get me" look right in front of his mother. Later the Mom asked him how that made him feel and he wisely stated...."She aroused the male in me, but not the heart in me." It is very important for boys to know the difference. That boy knew the difference and guarded his heart. Girls/women need to know what they are attracting also, are they getting looked at because they are arousing the male side or are they attracting the heart. I forgot...the dress/jumper will look cute made into a skirt. My daughters prefer skirts but do have a couple of dresses. Just a note on how we do the colder weather... Lydia (8) wears tights most of the time. When she is outside in the snow, she does wear snowpants with a skirt over them. I did try making a skirt but the snow still got up her skirt. Hannah (12) and i wear cuddly duds (walmart, sears) and with knee socks and an extra skirt underneath. Its harder in the summer, with the heat, we usually do a 3/4 length shirt with a shell under it. Or a t shirt with a long sleeve cotton t shirt under. Caleb (14) always wears an undershirt and i make sure his other shirt and jeans r not form fitting. I think its important for boys to be modest too! Joshua is still a baby (16 months) so hes the easiest one to dress. God is so good in helping me to instill these values in my children. Really its not an issue, its like brushing our teeth or wearing seatbelts. We just do it. As a side note this was a great topic of discussion in our house this morning! Also do u have any good websites for decent, classic clothes for babies and toddlers? I love things like sailor suits for the baby, but cant afford to spend a fortune! Plenty there for women and girls too. It took us many months of searching for what we are comfortable with. It doesn't have to look any certain way, it has to do with what meets our values. That's what I think some people are having trouble with, they feel it still needs to look a certain way. It can be a name brand as long as it is in accordance with scripture. We all have different taste.....like your taste for sailor suits! They are SO cute! We are blessed to live near several large communities of Amish and one large community of Mennonites. Wonderful people and we truly enjoy the simplicity of their clothing. I'll keep my eye out for web sites for you and I might be able to come up with a few patterns, one of my dear Amish friends is helping me make our daughter a dress. It has 18 pleats across the back....simply beautiful. They are very helpful, especially with our desire to dress more modestly. I hope the link helps you find what you are looking for! I know this is an older post but I just have to comment and say thank you from a fellow modest dressing family. My girls and I all wear modest dresses, skirts, and jumpers with modest blouses accordingly. The boys are never shirtless and always wear an undershirt under their button up shirts. No t-shirts alone except for pajama wear. No shirts except for pajama wear in this Southern heat and even then they are knee length. Us girls also wear modest gowns for sleeping. We get called odd, weird, etc. and of course legalistic. I'd rather be odd, weird of what they call legalistic than to be worldly and not be in obedience to scripture. Welcome Laura! I'm thrilled you stopped by and I am in complete agreement with you about how the world seems to see us. It is our family's convictions and if we do not live by our convictions, we are living in defiance. It is amazing however, when I began to follow where God was leading me, other women began to follow. Some need to see those of us who are taking a stand against worldly dress in order to gather their own strength against it. I have also met many younger women (early 20's) who have already got it figured out too, it is inspiring to see. I was in my mid 30's before my eyes were opened. It's encouraging to see that I'm not the only one that God has called to get rid of the pants. I know I'm still a work in progress. And to see that God has spoken this into the hearts of other women helps me not to feel like I just dreamed it. What do you think about head scarves? And skirt below knee or to the ankle? Tanya~ I truly believe we are all a work in progress and God calls us all in different ways at different times. Something that caught my eye the other day was a comment that was made on another blog. It said "God calls each of us to come closer to Him in the ways that are necessary for us". That hit me square between the eyes. When I first began to feel convicted to wear skirts, it was the oddest thing for me. When I began to feel convicted to cover my head, it was again, extremely odd for me, but as I obeyed my convictions, I began to understand due to the changes in my heart. We do wear long skirts for the reason that we like to be covered, not for any form of legalistic reasons. We do cover our heads, but not all the time and that is a grey area for us right now. There are mornings wear I feel the nudge to cover for the day and there are other mornings that I don't. Some may think that's riding the fence, but I follow my convictions that way. I will try to explain.....At times I feel convicted to cover my head, does that mean that I need to every day? Others sometimes see me with a prayer covering and other times they see me without one. It probably confuses them because they are attempting to put me in a neat little categorized box in their mind of what type of person I am. Yes, your outward appearance screams out who you are, but I was not raised to cover my head and the women in my church do not cover their heads and their are times when it's good for your conviction to convict others and their are times when your convictions can be stumbling blocks for others. It takes wisdom to know the difference and when to apply them. I wear skirts and cover my head as I am convicted to and obeying God draws me closer to Him. I do not do it to display Holiness and my husband does not demand it of me either. My wonderful husband fully understands and agrees with the why, how and when of everything I do and he knows that what I do, I do to glorify God and not for man. It in turn does show respect and submission to my husband which God calls all of us to do, however, this is where that earlier comment applies. God calls each of us to come closer to Him in the ways that are necessary for us. I love your style of modesty! And I have many skirts/dresses like this in my shop. Do you have a page with modest clothes links on it? If so, I would love if you would mention my shop. Totally old post here, but I just found this. I've been seesawing back and forth for years, convicted to dress modestly but offended that men can wear skin-tight jeans and nobody calls them to dress modestly. Then, when I do dress modestly (and I cover), I'm teased, insulted, or told I'm being legalistic. This pushed me back into dressing modern-day "normal," but I hated it, and my chronic pain condition made me so sensitive that I actually hurt dressing that way. So now I'm trying to do skirts (but I'm having a hard time finding waistbands that don't hurt my skin) and having dresses made for me out of linen. For those who get very hot in summer, give linen a try. Not only is it very healing to the body (only wool and linen are, unless woven together because their frequencies cancel each other out, moving in opposite directions~gives Deuteronomy a whole new meaning to me), it is more breathable than cotton, wicks moisture away from the skin, and helps to regulate temperature. Many who wear linen in the summer say they stayed much more comfortable than the people around them. Anyway, long story short, perhaps God has made an excuse for me. I won't lie. I'll tell people I'm convicted to dress modestly but I choose the style I'm wearing because it's the only thing that doesn't hurt my skin. I find it definitely heartbreaking that Christian women can attack each other. Many call it prideful to dress "old-fashioned" because they think you are calling attention to yourself, and that is "prideful" as though you are looking down on anyone who doesn't choose to dress as you. Maybe I should just start saying, "I'm sorry you feel that way" and move on. P.S. Sharon, many ladies who aren't Amish dress in cape dresses. So if you want to, wear them. If you don't wear the traditional prayer cap or style of veil, I'm sure you'll be fine.